Aquinas extended their recent winning streak with a solid enough victory over Ulidia at a boggy Cherryvale on Saturday morning to continue their climb up the South Belfast Youth League. Despite a couple of late cry-offs the Blue and Blacks looked strong from the outset and deservedly went ahead on eight minutes when the first of many sparkling runs from Conor Toner ended with him squaring for Paddy O’Boyle who made absolutely no mistake from the edge of the box. Aquinas then settled into a rhythm and dominated for long periods of the first half with Cormac O’Hanlon’s guile and Conor Flynn’s strength providing the platform for the front men to strut their stuff. On 19 minutes O’Boyle burst through again and almost grabbed a carbon copy of the first, only to be denied by a fine save. Livewire striker Conor O’Doherty was on hand to profit though, as he expertly dinked the rebound over the unfortunate Vernon in the Ulidia goal. The game’s standout moment came in the 35th minute after a period of sustained pressure on the home defence. Joe Cunnane’s craft created some space on the right for marauding centre-back Hugh O’Connor who set off on an amazing run, skipping past three defenders before unleashing an early contender for goal of the season with an unstoppable bullet into the roof of the net. Fittingly, it was Toner who provided the finishing touch to the half when he prodded home the fourth from six yards after great work on the left by Thomas Cafolla. The second half followed a similar pattern to the first with Aquinas, for the most part, on the front foot. Niall McCourt fired narrowly wide from distance and Tom Maguire saw a towering header graze the woodwork before Toner, yet again, was the architect as skipper Matt Carson slid in the fifth on the hour. In the closing stages Carson returned the favour for man of the match Toner to grab his second just before a lovely move on the left saw Matt Hughes and Peter Morgan combine to set Kevin McGovern up to side foot home with some style. This final flourish from Aquinas put a somewhat harsh look on the scoreline for a spirited Ulidia squad who played with a lot of pride throughout the 80 minutes. This encounter between Aquinas and Ballynahinch at Blacks Road was very much a game of clichés. It was a game played in the middle of the park and as any studio pundit worth his fee can tell you, it was a game of two halves, both, unfortunately, as frustrating as each other. There is no doubt that the Aquinas defensive and midfield lines were more settled and got into the game quicker than their County Down rivals. However, despite Trojan efforts from the Aquinas strike force of Michael Close and Samuelle Quattromano, who ran every inch of the Ballynahinch third, they could not break down the big centre backs from Ballynahinch. In the end, it took 28 minutes and a superb solo run from Daire to beat their giant of a keeper to give Aquinas a 1-0 lead at half time. In the second half Damien Magee came on for Michael Close and had to come deep to collect the ball. He started a great training ground move with John Toner and took the ball into the box where his ankles were unceremoniously clipped by the defender. Down he went for a stone wall penalty. Unfortunately, the penalty kick went right off the post and it stayed at 1-0 until the last minute of the game. Aquinas’ pressure then earned a corner as the Ballynahinch defence struggled to cope with the vigour of the South Belfast men. Ward Farrell took the corner and it was hurriedly cleared to the edge of the penalty box where the waiting Ward took one touch and calmly smashed it into the top corner of the net with his left foot. There is no doubt that Aquinas had more chances in the second half to put the game to bed earlier than they did, especially when Rory Cullen came on for Samuelle. That bit of extra height and speed provided Rory with at least three great chances all of which were saved by an impressive Ballynahinch keeper. Rory’s ability gave Aquinas a definite edge and with a bit more composure they could have bagged a couple more. The man of the match award went to Ethan Carleton who ruled the back line with ease. His ability to get under the ball and clear it from Ballynahinch kick outs gave Luke O’Sullivan in goal very little to do, though Luke did save us from embarrassment on at least one occasion. MOTM: Ethan Carleton. AQUINAS: Luke O’Sullivan, Steven Quinn, Damien Magee, Ethan Carleton, Michael Close, Ryan Shaw, Ward Farrell, John Toner, Lorcan Fitzsimmons, David Connolly, Samuele Quattromano, Phelim Lennon, Ruairi Lynch, Oran Boyle, Rory Cullen. This was a very different game from the first meeting of these two sides in September, when Aquinas strolled to a comfortable win. On Saturday at Blacks Road, Bangor were much improved, and Aquinas had one of their off days. Aquinas dominated much of the early possession, but didn’t seem to know what to do with it. 15 minutes had passed before a typically messy goalmouth scramble allowed Matthew McCrory to tap in from close range. Aquinas were unable to push on, however, and Bangor then had a number of opportunities, forcing fine saves from Jack Johnstone in goal. Just before half time Ryan McGuigan eased the nerves with a second goal, heading in a fine cross from John Blaney. The second half continued in the same, poor vein, and it was 15 minutes before Jake Morrison played a good ball through for Ryan McGuigan to make it 3-0. 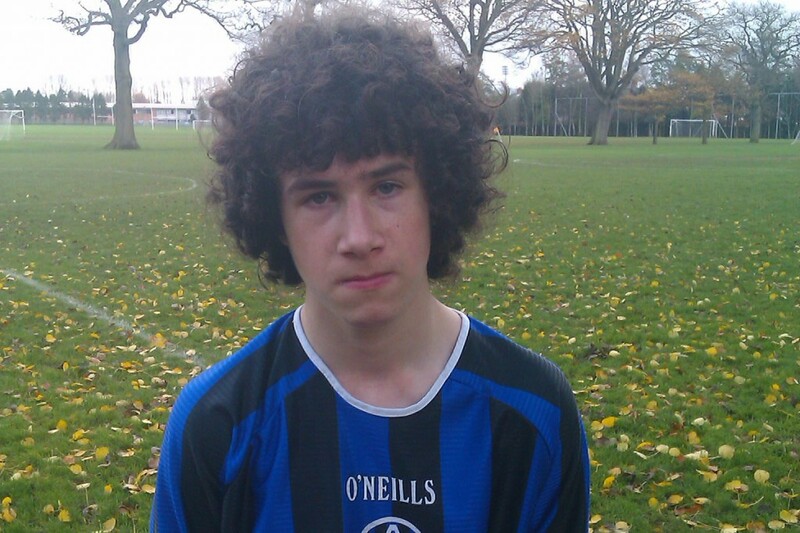 With the game now safe, Ronan Whyte made it 4-0 before the end, scoring from the rebound after a Ciaran Diamond shot. This was possibly Aquinas’s worst performance of the season. Jack Johnstone did all that was required from him in goal, and Rory Flynn and Daire McGarvey had good games in defence. Otherwise, few other players played to the standard they are capable of. AQUINAS: Jack Johnstone (Tiarnan Cahill), Frank McCormack (Ronan Whyte), Rory Flynn, James Carson, Daire McGarvey, Peter Lavery (Ciaran Diamond), Matthew McCrory, Darragh Doherty, Jake Morrison, Ryan McGuigan, John Blaney.